This discussion dovetails quite nicely with some thoughts I’ve been having recently about the efficacy of immigration and how immigration can be “engineered” to benefit the receiving nation (in this case, America and other western nations, but in theory this could apply to any nation). The basis for a sound immigration policy begins with the principles I delineated several months ago, such as requiring assimilation, making policy based on national needs, zero tolerance for illegal immigration, etc. These are only the “basics” for a reasoned immigration policy, however. These are principles from which a nation should begin, not the place where the immigration policy of a wise leadership of a nation will end. In the spirit of comparing analogs between the physical and social sciences, I believe we can approach the question of what would constitute a successful optimum for immigration by drawing an analogy with the metallurgical process of alloying. In a nutshell, alloying is the process whereby a minority component(s) (the alloying agent[s], the solute[s]) is added to a majority component (the base metal), forming a solid solution. Most often this is accomplished by melting the components, mixing them, and allowing the subsequent alloy to cool. There are two basic types of alloys – substitution alloys and interstitial alloys. A substitution alloy is one in which atoms of the alloying agent replace atoms of the base metal in the crystalline structure of the solid alloy. An interstitial alloy, on the other hand, is one in which atoms of the alloying agent actually embed themselves in the interstices, the gaps between the atoms formed in the crystalline lattice (see figure below). 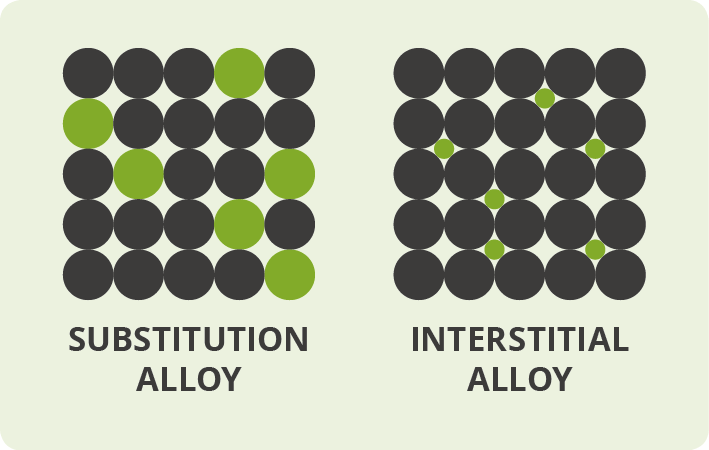 What typically determines whether an alloy will be substitutional or interstitial is the relative sizes of the atoms involved, which depends the most upon the period(s) to which the atoms belong (the horizontal rows of elements in the periodic table). When the atoms involved in the alloy are relatively similar in size and possess similar electronegativities, the alloy will be substitutional – the alloying agent(s) atoms can more easily take the place of the base metal atoms without too great distortion of the crystalline structure. When the atomic radii of the solute atoms are ~60% or less that of than the base metal, then the smaller alloying agent atoms will fill the interstices since doing so will not badly deform the crystalline lattice and generate a much higher energy state and more unstable structure. Essentially what allows alloys to exist is the fact that the solute atoms do not dislocate the base metal structure too much. Typically, substitution alloys can contain greater percentages by mass of solute atoms. Conversely, interstitial alloys tend to contain lower percentages by mass of the solute elements. Some examples of common substitutional alloys include bronze (78-95% copper, 5-22% tin), brass (65-90% copper, 10-35% zinc), and Nichrome (-80% nickel, ~20% chromium). In each case, the atoms involved are all Period 4 or 5 metals with similar radii and electronegativities. A couple of examples of common interstitial alloys include steel (95-99% iron, 5% or less carbon, plus other trace elements) and Zamak (~95% zinc, 4% aluminum, 1% copper, trace magnesium). In these alloys, the smaller Period 2 and 3 atoms (i.e. carbon and aluminum, respectively) occupy the interstices formed by the crystal structure of the base metal. Some alloys may be both substititional and interstitial. For instance, stainless steel (~50-70% iron, ~10-30% chromium, plus smaller amounts of carbon, manganese, nickel, etc.) has the chromium atoms substituted into the iron’s crystalline structure, while carbon atoms occupy the gaps in the lattice. I believe there are some lessons we can learn from this which we may apply to a sound and pro-active immigration policy. First of all, the process of alloying metals exists because alloys exhibit desirable properties which improve upon the base metal, such as increased hardness, ductility, malleability, or other properties which can be engineered into an alloy by choosing the right proportion of solute(s). Every national group has strengths and weaknesses which are related to the complex interplay of all kinds of traits ranging from average national IQ and average physical capabilities to various “intangibles” relating to culture and history such as artistic inclinations, hotbloodedness, industriousness, and many, many others. These “national traits” are a real thing, and they can help a nation decide who it wishes to allow to immigrate or who not to. We should understand that the introduction of any foreign element into one nation will result – even with eventual assimilation and acculturation – in a greater or lesser degree of “cultural drift” over time, analogous to the distortion of a base metal’s crystal lattice when a differently sized solute atom is introduced. The question is to decide what level of distortion is acceptable with relation to the introduction of immigrants who will tend to possess the traits desired by their host country. Second, it is apparent that the level of immigration, as with the percentage of mass of solute atoms introduced into the base metal, can be higher when the solute atoms (immigrants) are more similar to the atoms of base metal (native citizens). One can introduce 20% by mass zinc into copper and produce a beautiful brass alloy. One cannot introduce 20% by mass carbon into iron and produce any kind of load-bearing steel alloy. Carbon is too dissimilar from iron for that much to be successfully introduced, whereas zinc is very close in size and electronegativity to copper. Likewise, a nation can more successfully introduce and assimilate immigrants from culturally similar foreign nations than it can those from grossly dissimilar cultures. For example, the United States saw quite reasonable success in grafting other Europeans (and especially the northern and western Europeans) into its original Anglo cultural stock – these immigrants *did* affect the culture to a certain degree, but America remained overall an Anglo-cultured nation and assimilated these immigrants rather well. The same cannot be said, however, for the more recent mass of immigration from widely dissimilar cultures from all over the rest of the non-European and non-Anglo world, who in the last 40 years have introduced greater cultural distortion and dislocation than did the immigration that occurred in the previous 200 years. Masses of non-European immigrants into a European-derived nation cannot be successfully assimilated as European-derived immigrants can. Of course, it doesn’t help that we’re barely even making the attempt to do so anymore. This doesn’t just apply to European and European-descended nations, either. India, for example, could much more readily introduce and assimilate immigrants from other culturally Hinduised nations such as the Nepalese or Javanese than they could immigrants from either Africa OR Europe. Likewise, China would better be able to acculturate Koreans and Mongolians than they could Canadians or Brazilians. A third point we should draw from this is that we should not necessarily fear immigration. Control it, yes, but we need not fear it. No nation remains the same perpetually. It should not be the goal of any nation to remain exactly as it always has been indefinitely. Each nation, for the good of its people, should strive to pursue genuine national progress (not to be confused with the false kind proposed by political “progressives”) in the arts and humanities. Nations can hang onto good traditions while revising or improving the bad. Nations can also allow in small numbers of foreign elements without having to submit themselves to wholesale inundation. The Roman Empire benefited from allowing in a few talented Germans like Stilicho. It was detrimented by the mass influx of Goths under Fritigern. It is to our nation’s benefit to be receptive to talented individuals who desire to seek their fortunes here – more so the case if they’re from culturally similar foreign nations, but this can even be the case for smaller numbers of “talented tenths” from more dissimilar nations. Mass immigration is always a bad idea (and can, often, more correctly be term “invasion”), but low levels of rigourously controlled entry do not have to be a bad thing. This brings me to my fourth and final point, which is that alloys exist by design. They don’t just happen. Alloys do not exist in nature except in some exceedingly rare cases. Practically all of the alloys used by man today were designed and created by man, specifically for his own purposes. Similarly, the immigration policy of a nation cannot be allowed to “just happen.” It must be a deliberate process that exists for the purpose of engineering and designing the development of the nation in the directions that the natural aristocracy of the nation knows will be best. The balance must be struck between maintaining good traditions and preserving the traditional mores and religion of the nation, while at the same time allowing the introduction of elements which will strengthen, rather than weaken, the national resolve, the national morals, and the national strength. Immigration is essentially a process that creates a social alloy. The wise nation will control this process so as to strengthen its long-term social cohesion, as well as its strength, hardness, ductility, and so forth. Pure, raw iron has little tensile strength, while high-grade steel with just a small percentage of carbon in it can be used to build skyscrapers. Change is inevitable. The success or failure of any neoreactionary and Traditional system will not be whether it can stifle and hold back change, but whether it can control and adapt it in such a way as to restore and maintain the good while developing the bad into something better. Nations must deal with scientific advances, the introduction of new ideas, natural disasters, and many other things. Resilience allows them to weather these trials and emerge stronger, while brittleness sees the nation which cannot adapt be shattered upon the rocks of history. The wise nation will utilise whatever means are at its disposal – including an immigration policy crafted for its own national needs – to pursue its own survival and efflorescence in the cutthroat competition of this fallen world. As to the question of where that “optimum point” is, the answer would be – “It all depends.” Overall, though, the more culturally dissimilar a group of potential immigrants is, the smaller the “percentage by mass” which should be introduced, if they are to be introduced at all. Ultimately, the perceived needs of the nation’s leadership – assuming this leadership has the best interests of the nation in mind (which can’t necessarily be said for the current “leadership” in most western nations) – will determine who should be allowed in and to what extent. And certainly, it is to be considered always in the best interest of a nation to avoid the sort of uncontrolled mass immigration that is being allowed, and indeed encouraged, by today’s globalist-minded transnational elites. I agree. Also, very didactic. Very sensible thinking on a difficult topic. I’d add that it also depends on the ability of the host society to tolerate immigration to begin with. For example, the USA/Canada have been importing new immigrants for a long time, and excel at first accommodating and then assimilating them. In much of Europe, new immigrants often seem to end up ghettoized, which leads to social problems. Those countries would probably be much better off severely curtailing or abolishing immigration altogether. Very true. Accepting immigrants is a part of our cultures (though it also appears that this has its limits, as we’re starting to see). Another example of the opposite end – Japan. Almost no immigration takes place into Japan, and the Japanese seem perfectly happy for this to be so. I say, if that’s their choice, then let them make that decision. This is a short text about nation and tradition, by Professor Miguel Ayuso Torres, a Spanish Carlist and one of the most prominent contemporary traditionalist philosophers. Taken from a short text made to commemorate the 30th anniversary of the death of a Carlist comrade. He pointed (his friend) with rigor <>, those just this segment of continuity in these glow: <> Faced with these explanations, tradition defines people as accumulated history, considering such physical factors to the extent that have affected the historical trajectory for what they are: but never as valid by itself, directly and exclusively elements. Such a discrepancy in the vocabulary is not trivial. It is rooted in something very important: that the traditional thinking stems from the Christian conception of man, while vulgar saying is imbued with positivist ideology. The tradition is based on the doctrine of classical Spains. Positivism in unhinged ideological approaches of the nineteenth century. So they only handle the concept of nation in law and political science in vogue, ignoring what tradition means as living history taking on political issues (…). The tradition born of life. It is in the words of Enrique Gil Robles, ”the continuity of life itself.” All life, indeed, curdles into a set of experiences and works that endure when the man who made and harvested disappears from the scene of the living. All human existence till a transmissible treasure to men who come after, being fully the quality of heirs accumulated by previous generations what distinguishes man from animals. When we are born, we not born naked and abstractly. Before, on the contrary, we are born possessing vital formulas transmitted by our parents and integrate what we say our culture and our tradition. So as gravely said Donoso Cortés ”peoples without traditions become savages”. Thanks for dropping by and thanks for the comments! (Sorry for taking so long to reply). If you have a link to Torres’ writings in Spanish, please feel free to post it. My working knowledge of Spanish is pretty good (not fluent, per se, but pretty good) and written Spanish ought to be accessible to myself and other readers as well. Hi, Titus. Does not matter. I will. Thank to you for the great blog you have, men. You’re doing a good job and your articles are great! Sorry for the void sentences. But I would add that a social alloying model of immigration is only possible in an autocratic society that accepts reactionary ideals. A democratic society would quickly abuse the system and succumb to electoral rent-seeking, where one side* imports underperforming masses and uses various inducements to secure their votes. *Usually the Left, but no doubt the GOP would do the same if every immigrant was Cuban.